You can call me. If you have any questions do not hesitate. The prices displayed by the simulator correspond to the price out of season and vary according to the number of deposits desired. Thank you for contacting me for a quote. (1 bedroom 1 bathroom for 2 to 10 people). Attention, in order to respect the standards of security, the maximum number of sleeping is 15 people by lodging. A haven of peace 2 minutes from Valognes, Versailles Normand with its mansions, is located just 15 minutes from the landing beaches, Sainte-Mère Eglise, the port of St Vaast la Hougue and Barfleur or the Hague. Each cottage has a private entrance with terrace and flower garden, as well as a separate car park. Everything has been arranged so that the cottages can be rented together or individually as needed. They are totally independent, you will not be disturbed by your neighbors that you will not even meet if you wish. The relaxation area is open 7 days a week and 24 hours a day. This room will be shared with guests of other lodgings if they also take this option but the table will allow you to book your slots schedules desired to privatize this space. The SPA (Jacuzzi high-end 6 people) is covered by a pretty glass roof where it is very pleasant to bathe, protected from the rain overlooking the garden and the terrace. There is a walk-in shower, relaxation benches, a massage chair, a stereo, soothing light and an infrared Sauna 4 pers. There is a total of 21 rooms and 15 bathrooms and 13 toilets in the 5 gites of the property which are all close to each other. They can be rented together or separately, you will have no promiscuity or neighborhood. Everything has been designed so that each cottage can be grouped or remained independent by a system of doors or screens that open or close. No problem of noise either because each cottage has its own garden, terrace and parking. The Grande and Petite Duckerie can communicate together by an interior door to make one big house which is very practical because 2 kitchens (2 dishwashers, 2 refrigerators, one very large with ice cubes, 3 ovens, 2 microwaves ...) and two relaxation areas with club chairs. Great Duckerie used most often Dining friendly in which to dine facing the fireplace (possibility to grill prime rib in the fireplace). The little Duckerie with its big cozy white sofa serves as a lounge with its library, large flat screen TV and piano. The central island is often used to prepare the aperitif. You can eat together in the Grande Duckerie, possibility also to eat children for example in La Petite Duckerie on the island that has extensions. A very famous roaster in the region, can roast in the courtyard to make you to eat, typical meal of the region and delicious at attractive prices. It is also possible to serve you at the table or have breakfast delivered in the morning, etc. My advice is to rent Duckfly and the Bakery or La Voisine and the Bakery. You will enjoy 8 to 9 bedrooms and 4 to 7 bathrooms. You will have the reception room of 70m2 of the Duckfly with table to accommodate up to 50 people. Tiled floor imitation parquet, cement tiles, beam ceiling, neat and warm decor. You will have dinner in front of the garden (large bay window style workshop) and facing the monumental fireplace. Sono, home theater and light games to party and dance after the meal. Above 40 people: the entire property will have to be rented, ie the 5 gîtes for a total of 22 rooms and 15 bathrooms. Wifi, flat screen TV and home cinema in each gite. 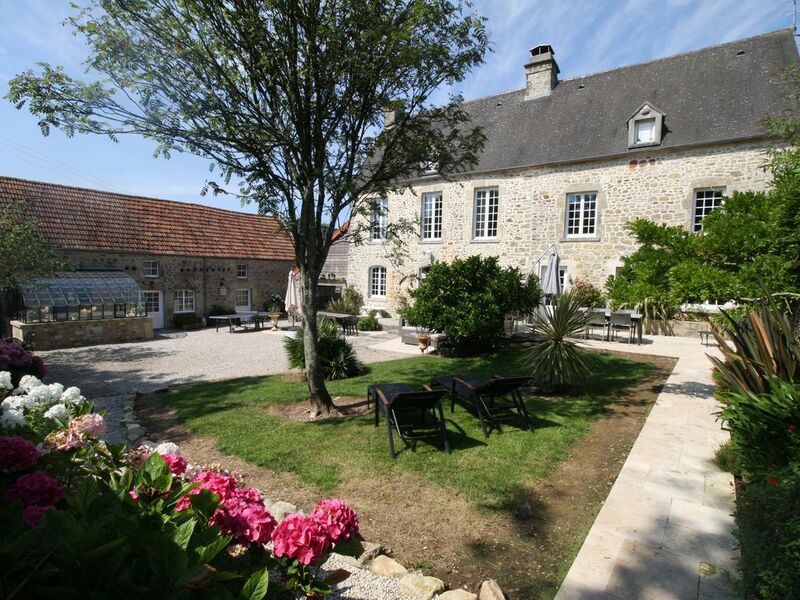 The property is 1 hour from Caen and 3:30 from Paris. It is very well placed because close to major roads and central. Tamerville is 15 minutes from the sea and the beautiful landing beaches. 15 minutes from St Vaast la Hougue (Tatihou island, Vauban towers: Unesco world heritage, Gosselin delicatessen ...), 20 minutes from the port of Barfleur (elected 3rd most beautiful village in France), possibility to do sand yachting at Quinéville or running with his dog. You will find in Valognes all the shops and the market on Friday morning. You can organize trips in the area such as: the regional cider museum and the Museum of Eau de Vie and Old Trades, the Cinema, the Animal Park in Montaigu la Brisette, the Cité de la Mer Cherbourg, the Cotentin peninsula golf, tree climbing Forest Adventure, La Maison des Marais, Stables de la Gare for a horseback ride, etc. To do in 20 min: Kayak of sea in the bay of Cherbourg, to visit the City of the sea or to visit the 2nd highest lighthouse of Europe in Gatteville-le-Phare. local market, flea market, hike in the Hague, there are three sides to visit. The cottages are located in a very quiet road 2 minutes by car and 20 minutes walk from Valognes where there are 4 supermarkets. This city is old and very beautiful. HOUSEHOLD: Between 80 and 240 euros per cottage depending on the size of the cottages. A deposit of 500 euros per cottage will be required upon arrival. If you do not take the cleaning fee, the price of the cleaning will be asked in cash upon arrival. Package extension departure after 11h: 50 €. Nous avons passé un très bon séjour à la Grande Duckerie. Tout était au rendez vous, le calme, le charme, l'authentique et la belle cheminée...Nous étions 10 avec un chien et nous n'avons pas manqué de place. la salle de jeux et la table de ping pong au top pour les jeunes. Le cotentin notamment Barfleur et Valognes sont des endroits magnifiques. n'hésitez pas, l'hôte est très disponible par email pour toutes les questions que vous avez à poser. Petit week-end cocooning au coin du feu. Le salon est très spacieux et avoir une chambre au rez-de-chaussée est très appréciable. L’espace Bien être (sauna , spa )est très accueillant, bien agencé et propre. Merci beaucoup pour votre agréable commentaire, malheureusement en ce qui concerne la pression de l'eau nous avons déjà tout essayé mais Véolia nous a dit qu'on était en bout de ligne et qu'il ne pouvait rien faire pour ce problème... Ils sont déjà venu purger deux fois mais cela n'a rien changé! Nous avions loué l’ensemble des gîtes pour notre mariage, ce qui a permis à nos invités de profiter de la beauté et du confort des lieux. Jennifer et Sébastien ont rendu ce séjour inoubliable. Nous les remercions énormément. Joli jardin fleuri, spa très agréable et bien conçu, bons équipements de loisirs (table de ping pong, babyfoot, jeux...). L'ensemble de nos amis a adoré le lieu, nous reviendrons avec plaisir !!! Milles merci pour votre très sympathique commentaire ! Les tarifs affichés par le simulateur peuvent être erronés, le prix dépend de la date que vous souhaitez. Merci de me contacter En week-end je ne loue pas la nuitée ou alors cela est possible mais cela ne changera pas beaucoup le tarif qui sera un tarif pour deux nuits. Les week-end férié sont plus cher. Le prix dépend aussi du nombre de gîte ou chambres souhaitez. Merci de me contacter pour avoir un devis plus précis, s'il vous plaît. Plan de la propriété afin de visualiser les chambres sur www.laclefdecamp.fr Forfait prolongation départ après 11h : 50€. Forfait SPA illimité : 100€ Week-end pour 10 personnes ou moins 200€ par semaine pour 10 personnes ou moins Spa : 10 euros par personnes si 20 personnes en week-end comptez 200 euros Sauna : 5 euros par personnes avec un minium de 60 euros Ménage : Entre 240€, 160€ ou 80€ selon la taille des gîtes merci de me demander Linge lit : 15€ par lit Lit fait a l'arrivée : 10€ par lit Serviette toilette : 8€ Peignoir : 8€ Bois : 20€ par brouette Animaux : 5€ par jour par animal Caution entre 500 euros par gite en chèque rendu au plus tard 7 jours après votre départ.